Some small business owners are nervous about claiming the home office expense on their tax return because they believe the deduction will trigger an audit. But by making this decision, the taxpayer may also give up the business mileage tax deduction associated with the home office. Can I deduct mileage if I establish a home office? Yes. To claim mileage from your home office, you need written records of all your trips and an eligible starting point. The mileage log displays an address where you begin and end all your business-related trips. ...you need written records of all your trips and an eligible starting point. Let's assume you do not claim the home office on your tax return. Then, what is your starting point for business trips? It cannot be a phantom address. How can I avoid mileage reimbursement mistakes? 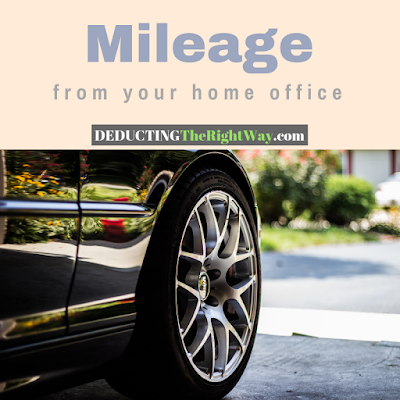 When you maintain a qualifying home office, take the deduction on your tax return so you can safeguard your mileage tax write off. If you do not list the home on Form 8829 (as the place where you regularly and exclusively conduct business), the IRS could make the argument that your mileage is also not deductible since it lacks a corresponding starting point. TIP: You can report the cost of the home office as a percentage of the actual expenses incurred for the designated area or as a flat rate per square foot. DISCLAIMER: Please consult with your accountant, attorney and financial advisor before implementing any tips listed on this website. DIY research does not replace the advice of a licensed professional who has thoroughly reviewed your file.